The Greenville Chamber presented Greenville Water with the 2018 ATHENA Organizational Leadership Award for its commitment to increasing the positive impact of women’s leadership in our community. 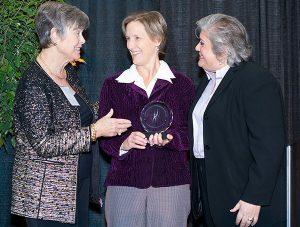 The fifth annual award was presented at the Chamber’s seventh annual ATHENA Leadership Symposium sponsored by BlueCross BlueShield of South Carolina on November 8, 2018. Greenville Water was presented the award for their excellence in and commitment to recruiting, developing, retaining and advancing women employees, as well as supporting women in the broader community. Twenty-two percent of Greenville Water’s employees are women and these women have made valuable contributions at all levels within the organization. This is made especially impressive when considering the industry is highly dependent on science and engineering and nationally, STEM-related careers have traditionally been dominated by men. Six of the 13 departments at Greenville Water are led by women. Greenville Water makes an intentional effort to provide support for female leaders by providing benefits such as a robust tuition reimbursement program or a mobile mammography unit during the annual health fair. Greenville Water excels at retaining women leaders and encourages mentorship throughout the organization. Greenville Water also actively supports women outside of company walls. Under the direction of the Commission and CEO, David H. Bereskin, Greenville Water distributes community contributions through direct funding and volunteerism. The organization actively supports community events that have a positive impact on the quality of life in greater Greenville and has supported the United Way of Greenville County for over twenty years with targeted programs for domestic violence assistance, adult literacy and financial stability. Greenville Water’s mission statement is simple: Quality Water; Sustainable Future. Recognizing that water service is critical to the health and well-being of its customers, Greenville Water ensures the reliable delivery of high-quality water through careful stewardship of its resources, while adhering to and surpassing health and safety standards. Greenville Water is committed to providing exceptional service to nearly 500,000 residents of the Upstate region of South Carolina. Governed by an elected Commission of Public Works, Greenville Water is the state’s largest water utility.